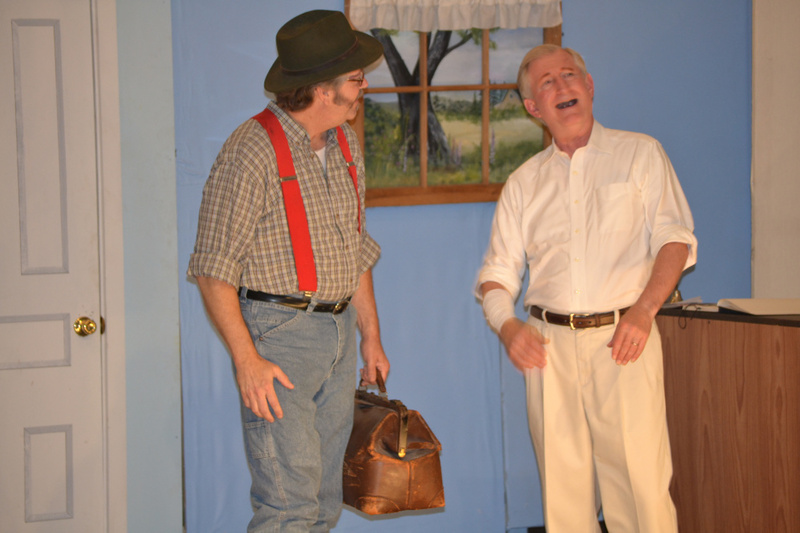 The Vienna Historical Society will present plays which portray the foibles and eccentricities of small town life. Performances will take place at 7 p.m. Thursday and Friday, July 27 and 28, and at 2 and 7 p.m. Saturday, July 29, in Vienna Union Hall. Brent Smith, of Farmington, will lead the audience in old-time songs, and perhaps a dance or two. Ellie Andrews, of Fayette, will accompany on piano. “Doctor’s Orders,” is set in 1918 when there are so many things a proper lady should not do, including reading dime novels, wearing slacks and voting. Along with these insults, Letty Madden cannot run the store she owns, Maddens Department Store. What can she do to deal with the frustration? She follows the psychiatrist’s orders to release her inhibitions, and unravel the intrigue of missing money and misplaced power. By play’s end mysteries are solved, romances resolved, and mistaken identities revealed. In this adaptation of a 1909 comedy by Kurtz Gordon, co-directors Cheryl Herr-Rains and Don Peterson bring out the humor and drama in their local cast of familiars: Allison Kuhns, Ridgely Fuller, Rocio Carey, Chris and Delaney Crocker, Muffy Floyd, Nate Kane and Don Peterson, and fresh faces this year, Maggie Chadwick, Karla and Ron Arsenault. For the second play, playwright Beverly Wight Smith is at the top of her game with “Making Josie Jealous,” a slice of life in 1920s Vienna. This romp is filled with the usual oddball, eccentric and just plain good folk that regularly populate Smith’s plays, along with their assorted escapades, antics, shenanigans and affairs of the heart. Family and close friends, worried about Josie’s safety living alone, and would like her to marry Walt, who has previously asked for her hand. But Josie, being an independent woman with a rich social life, is hesitant. The friends hatch a hilarious plot to push Josie into the arms of Walt. The cast of actors include Ellie Andrews, Andrea Dunn, Pam Bean, Steve Mallen, Matthew Dunn, Jim Wright, Clyde Dyar, Dan Huettner, Beverly Wight Smith, Judy Dunn, Barbara Gilman, Kitty Gee, Eileen Lord, Allan Harville and Carole O’Connell. The players are herded by Carole O’Connell. Admission will cost $6 and refreshments will be provided by the Mill Stream Grange. For more information, contact Carole O’Connell, president of the Vienna Historical Society, at [email protected] or 293-4815.